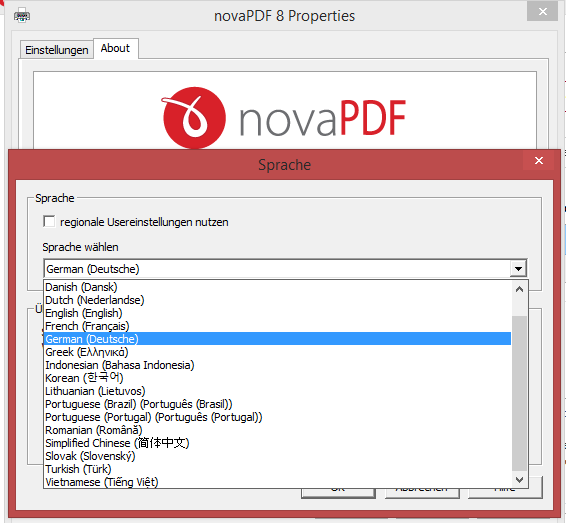 novaPDF 8.5 is now available, with even more new languages for the user interface. The latest version adds German, Croatian, Indonesian and Vietnamese to the list of languages the GUI is available in. You can download the latest version here: Download novaPDF 8.5. However, this version is not free for users of previous versions of novaPDF (1.x – 7.x). If you own a previous version and want to test novaPDF 8.5, you can install a 30 day free trial here: Download novaPDF 8.5. NOTE: Starting December 31st, 2015 novaPDF version 6.x and 5.x will no longer be supported. If you are still using one of these older versions we highly recommend an upgrade to version 8. This will ensure you get the latest updates and email support. Furthermore, novaPDF 7.x (and previous) has not been tested on Windows 10 so we cannot guarantee full compatibility. If you plan to use Windows 10 you should upgrade to novaPDF 8.x.